What if everything collapsed tomorrow? What if the shelves on the supermarket were empty? What if you couldn’t get gas for your tiller? What if you didn’t stockpile fertilizer… or water? What if you’ve never even planted a garden in your life… and your life depended on growing your own food? Grow or Die: The Good Guide to Survival Gardening has the answers. From hand tools that will till the ground better than a tractor to plans for growing all the calories you need in a crisis to easy-to-follow crop rotations that will beat the pests, this book is the cheapest insurance you can own against the crash we all know is coming sooner or later. You’ll discover how to scrounge for seeds in unlikely places. How to till without a tiller. How to preserve your harvest. How to beat pests without poison. How to convert a lawn into a food factory. How to garden to survive in emergencies and crises. 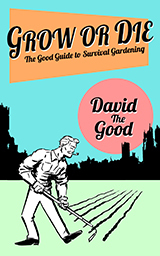 Expert gardener David The Good, author of the bestselling Compost Everything: The Good Guide to Extreme Composting, has written the gardening book that could one day save your life. Easy to follow and entertaining, Grow Or Die doesn’t bog down in the technical details, but focuses on how you can turn your garden into a tool for survival. It’s perfect for those interested in preparedness, low-tech gardening and living with a lighter, more ecologically sustaining footprint. 142 pages. EPUB format. DRM-free.